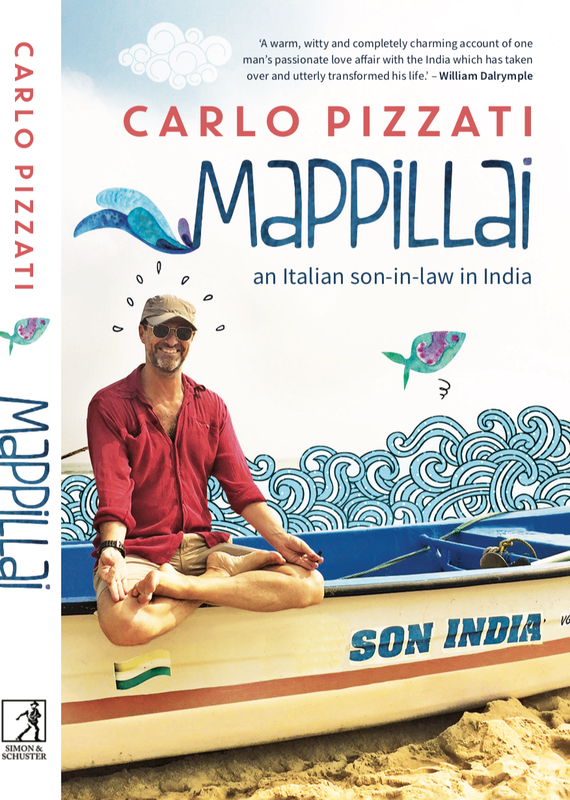 “Mappilai – an Italian son-in-law in India” (Simon & Schuster 2018) is the rollicking story of a European living with his in-laws in urban Chennai and with his wife in the coastal village of Paramankeni. There, he finds himself in the company of fishermen and goat-herders, in a house where 3G asserts itself in a corner of the bathroom and electricity courses in fits and starts. At one level, Mappillai is deeply personal. With beguiling candour, Carlo tells of his struggle with contradictory responses to India—fascination and suspicion—and his awkward attempts at cruising through a maze of bribery, bureaucracy and traffic. The book offers a glimpse into the world of expats in India by introducing us to a host of colourful ‘firangi-friends’—from those who are overwhelmed by this nation’s noise and colour; to those who ‘go native’ in kurtas; to those who believe that India is where they can be dreamers, yogis or artists. Over his decade-long stay in this nation, Carlo has witnessed a land in flux—from the gloom and doom of 2008 when the New India dream shattered, to the heady optimism of 2015 with promises of ‘acche din’, right up to today, marked by anti-Romeo and gau-rakshaks squads. With wry humour and jollity, wisdom and acceptance, Mapillai offers an intimate capsule of contemporary Indian history—of the concomitant Hinduization and Westernization of India, intertwined with the Indianization of a European! “Edge of an Era” (Juggernaut 2017 – English) is a collection of three conversations about the return of barbarism, the threat to cosmopolitan identity, the rise of nationalism, the many failures of globalisation, the increasing challenges of technocracy, and the crisis of the neoliberal elites. In the lobby of the Bauer Hotel in Venice, critical theorist Homi Bhabha speaks of the crisis of the Western paradigm, with a glance to what’s been happening in America. Pankaj Mishra, in a house facing the Bay of Bengal, expands on the intellectual dialogue between Asia and Europe. Political philosopher John Gray, at the Taj Mahal in Bombay, analyses the current European political crisis, the rise of fascism, and reminds us that the main driving force in history is human folly. The book opens with an introductory personal essay in which Carlo Pizzati explores recent historical milestones and the transformation they’ve brought about in Europe, America and Asia until now. “Nimodo,” Pizzati’s second novel (Feltrinelli 2014 – Italian and Spanish), is a love story taking place across several Latin American countries between Italo Prazzic – a young, idealistic foreign correspondent in Latin America – and Patricia Colz – a performance artist who turns out to be a guerrilla fighter and a spy – while their nemesis, older journalist Rizzo Placati, tries to get in their way. The fact that the characters names all all anagrams of the author’s is no coincidence. On the background of a 1997’s Latin America constantly changing but always staying the same, idealism and cynicism areintertwined with a long on-the-road adventure, where telling the story is interlaced with being the story. “Criminàl”, his first novel (FBE 2011 – Italian), sold out the first printing in a month and a half. Italian critics have said about it: “A powerful metaphysical thriller” (Valentina Pigmei – Grazia); “A surprising literary twist” (Luciana Sica – La Repubblica); “A most beautiful book” (Daria Bignardi – Invasioni Barbariche); “Past and present chase each other on a fine thread of hallucinated and ferocious suspence” (Maurizia Veladiano – Il Giornale di Vicenza); “A literary frame shining with constant digressions and changes of narrating voice” (Leonardo Merlini – TM news); “Criminàl is a book that sticks in your mind. It has real stylistic experimental strength and sociological inventiveness, after the era of the all too easily pre-programmed and recognisable, homogenous novel” (Emanuele Zinato – professor of Comparative Literature, Padua University). “Tecnosciamani” (2012 Il Punto d’Incontro in Italian) is a humorous, illuminating narrative non-fiction book in which the author roams the world searching for places where technology and spirituality intersect. The driving force of the book is the narrator’s quest for relief for a bad back which has tortured him for twenty years. Describe by critics as: “atypical and interesting” (Wired Italy); “intriguing and ironic” (Associated Press Italy); “glocal eye and subtle irony” (Sole 24 Ore); “agile and ironic writing” (Il Manifesto) and “an original mix of spirituality, technology, desire to cure a chronic backache and encounters on the borders of science, mysticism and the irrational with a flavour of an original and most ancient knowledge” (Il Giornale di Vicenza). “Il passo che cerchi” (also in ebook format here) is a collection of short stories and photographs (Edelweiss 2012 – Italian) investigating the relationship between narrator and characters and their interchangeable identity. “A world reflected in infinite other worlds, possible and real” (Silvia Ferrari, Il Giornale di Vicenza). “The book is boiling in literature, in the shape of instructions for life”. (Kilgore Magazine) . “This writer has the capacity to make you dream, shiver, laugh and cry within the same page” Zacforever literary blog. The three sections (“World”, “Numbers” and “Cards of Identity”) explore different aspects of the exchange of identity and the relationships with numbers and codes in our daily life. In “Fibonacci Story,” a homage to the school of writers called OuLiPo, a bloody tale is being told observing the rules of the Fibonacci sequence. In “Time does not exist” the philosopher Zeno discusses with physicist Peter Lynds the non existence of space versus the non existence of time while precipitating from an airplane. Most of the book plays with literary references as in one of the last short stories in which we see secondary characters from a Nathanial Hawhtorne and a Goffredo Parise short story actually interact. Nimodo podría ser perfectamente el trasunto novelado del guión de una ‘road movie’ del mismo título que podría, a su vez, ser considerado también y a la francesa ‘un film à thèse’ como un milhojas en el que cada estrato se corresponde con un nivel de lectura. Así, pues, tendríamos, como capa superior del pastel, la peripecia de dos periodistas y una activista revolucionaria por toda una serie de países de Iberoamérica. Este estrato está perfectamente articulado y muestra cuánto domina Pizzati la técnica narrativa. Digamos que es el nivel responsable de hacernos reír, llorar, lamentarnos y disfrutar de las distintas situaciones en la que los protagonistas se ven envueltos. Lo que nos engancha a querer saber más y más sobre lo que será de ellos al cabo del relato. En un piso inmediatamente inferior, conocemos aspectos de la conspícua realidad socio-política de América del Sur (Mesoamérica incluída), ese continente con forma de corazón. Un corazón que sigue latiendo ante la incomprensión del entendimiento europeo y ante lo que el autor se esfuerza por huir de la toma de partido previsible o fácil. Nimodo (traducción y postfacio de José Manuel Mercado Navas) – 280 pp. Compra el ebook en Amazon aquí.